If you have a special someone in your life who is a fan of fountain pens, choosing the perfect gift for them might seem impossible. Pen users and collectors can be quite opinionated about what they like and prefer to use. I know that my wife has a really hard time buying gifts for me, either because I’m very picky or already have what I want (or both). If this sounds familiar, I’m here to help. Below, you’ll find a variety of pen-related items that I’m sure almost any fountain pen user will enjoy or find useful. While I can’t guarantee that they’ll be a hit with everyone, most people that I know would be more than happy to receive any of them. As I mentioned, fountain pen users can be rather picky and have opinions on what they do and do not like in a pen. Still, there are a few fun pen options that should appeal to many pen users. They are inexpensive enough that they shouldn’t break your budget while being unique enough that most pen users will still enjoy them, regardless of how their tastes run. 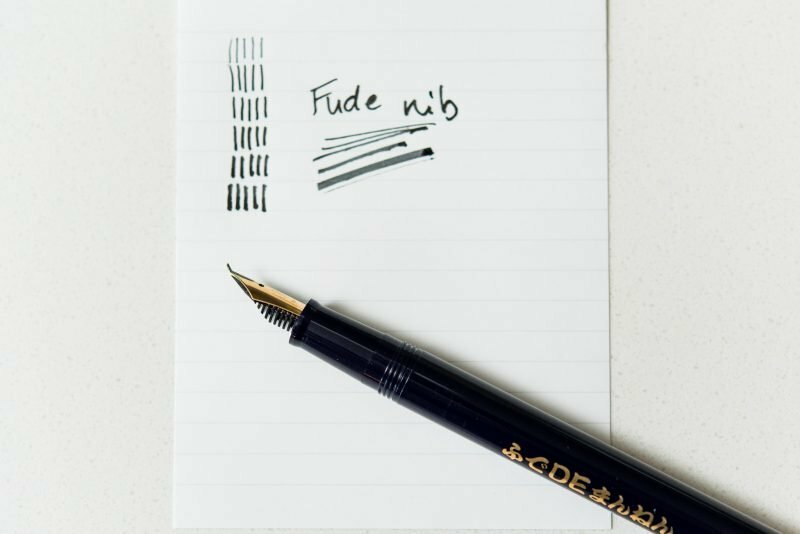 This fude pen has a unique nib shape that can create lots of line variation. Sailor Fude Pen – This pen can provide an enormous range of line widths due to its unique nib shape. Kaweco Sport in either Brass or Aluminum – These little metal pens are both hefty and well-made, allowing them to go anywhere and stand up to the toughest of users. Moonman M2 – Most fountain pen users don’t have a pen that fills with an eyedropper, and the clear barrel on this pen allows you to see the ink sloshing around inside. Cheap paper that’s not made for fountain pens can be miserable to write on. On the other hand, sitting down with a nice notebook or pad of paper is one of the joys that makes using fountain pens so wonderful. In my opinion, you can never have enough good paper if you’re a fountain pen user. With that in mind, I’d like to offer up a few notebooks and pads of writing paper that are some of my personal favorites. All of these papers are fountain pen friendly and are wonderful to write on. Life L. Writing Paper – Life makes amazing paper and their L. Writing paper is some of the best around. 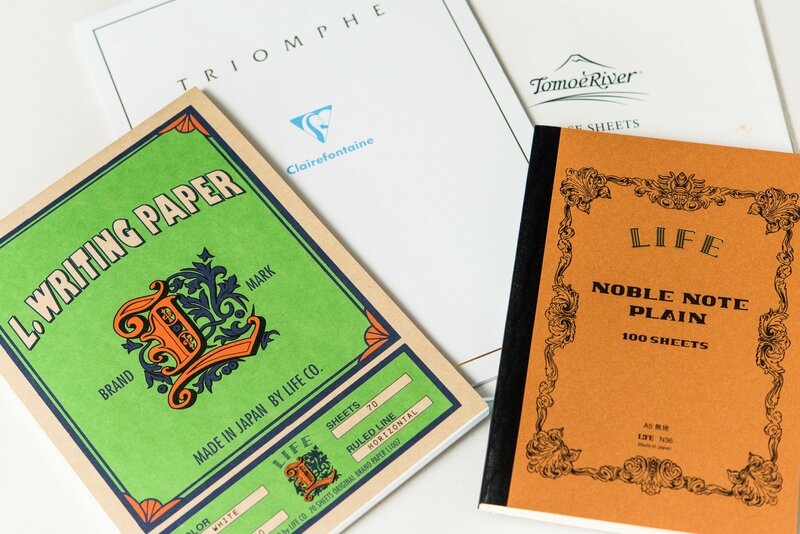 Clairefontaine Triomphe – Clairefontaine is a French paper company that’s been making paper for centuries and their Triomphe paper is some of the finest and smoothest paper you can buy. Tomoe River Notebook – Tomoe River is arguably the most popular paper with fountain pen users and this notebook is filled with it. 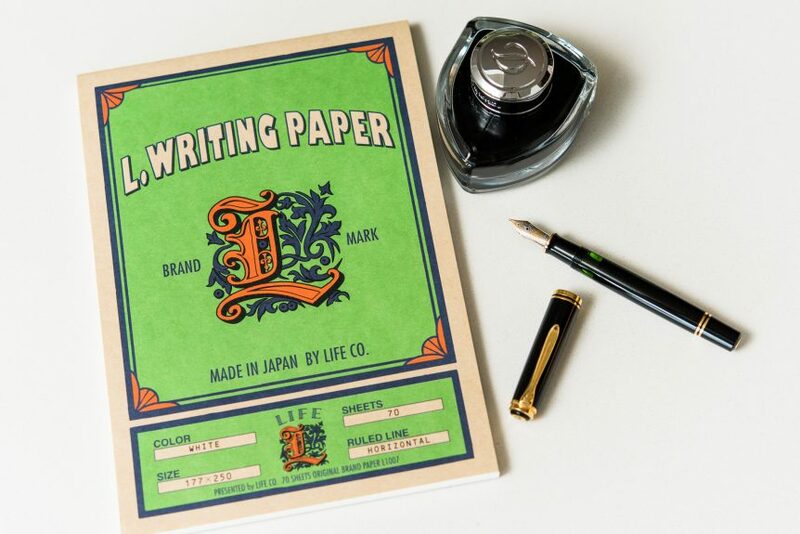 Life Noble Notebook – I already mentioned how good Life paper is and their Noble line of notebooks are some of my favorites. Midori MD Notebook – Midori MD notebooks are wonderful, all-purpose notebooks that are a pleasure to write in. Without ink, a fountain pen is pretty much useless. While most fountain pen users already have more ink than they know what to do with, having a little more never hurts. 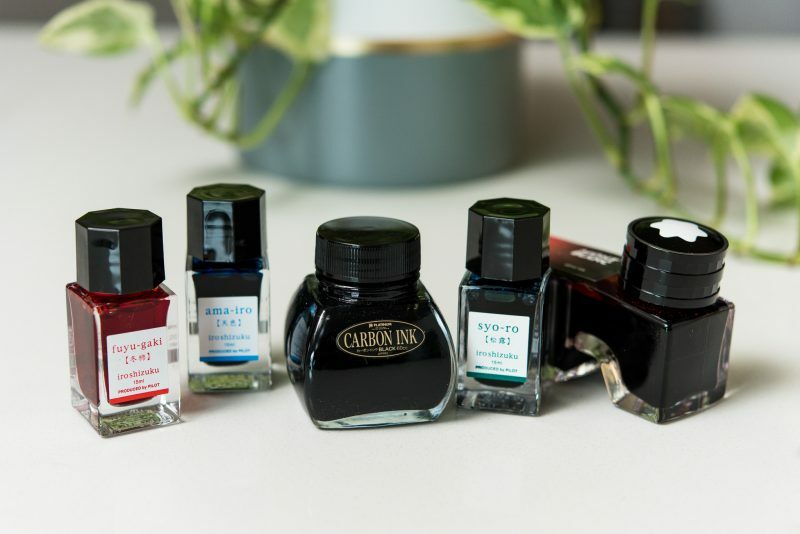 Any of these fountain pen inks would make a great gift. Iroshizuku 3-Pack – Iroshizuku makes some of the most respected inks around, so while you can’t go wrong with any individual bottle, one of these 3-packs offers multiple colors to enjoy. Montblanc Ink – Montblanc inks are considered to be some of the safest and best inks you can use. Any of their basic colors are great options, but for someone really special you might consider a limited edition color. Platinum Carbon Black – If your pen lover also likes to draw or doodle, this ink is about the best waterproof black ink you can buy. When you spend a lot of money on fountain pens, having good protection for them is important. Whether it’s a single pen sleeve or a case that holds multiple pens, any of these would make a great gift. Pen cases or a pen sleeve are something that every pen user should have. 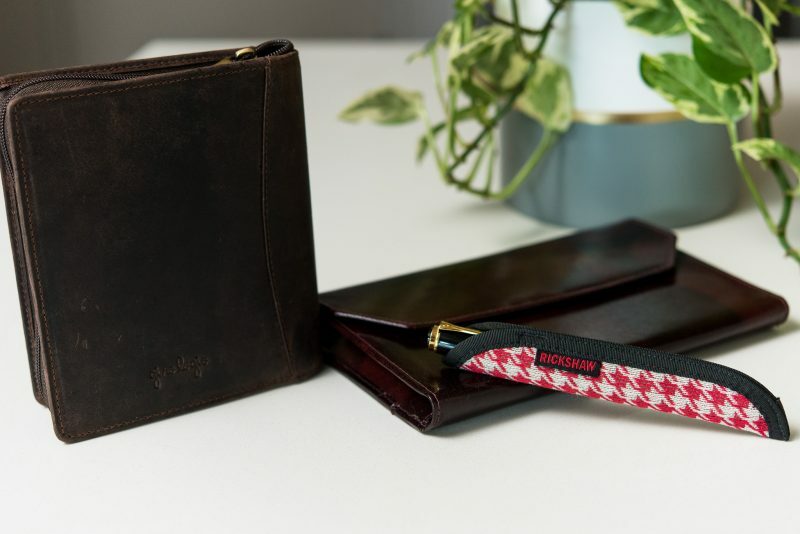 Rickshaw Pen Sleeve or Roll – Rickshaw has many different pen sleeves and accessories, all of which are lined with their incredibly soft plush material. Girologio Pen Case – These fine leather pen cases come in many different shapes and sizes and are sure to please almost every pen lover around. Nock Co. Pen Case – Nock Co. pen cases are known for their unique designs and fun colors. Leather Notebook Cover – Even notebooks need protection and this leather notebook cover will keep a paper notebook safe, whether it is in a bag or sitting on a table. Finally, if you’re unsure about what to get the fountain pen lover in your life, there’s always a gift card. A few of the major online fountain pen retailers offer gift cards, so let the recipient of your gift pick out something that she’s always wanted. Another option would be to make your own gift card and take them to a local shop that sells fountain pens and accessories. While the selection might not be as good as you’d find online, there’s just something fun about going to a shop in person to touch and feel everything before deciding on what to buy. I hope you found this helpful and it gave you a few fountain pen gift ideas. Purchasing a gift for a fountain pen user is never easy. Differences in preference and taste make buying for one person much different from the next. While I can’t promise that everyone will love everything on this list, I’m pretty confident that most people would think that these are wonderful gifts. Good luck! One more thing to note… some sellers on Amazon ship directly from Japan, so be sure to check the estimated arrival time for anything that you purchase as a gift to make sure it will arrive on time. I have waited for over a month for a single pad of paper to arrive from Japan. This is definitely something that you’ll want to be aware of before placing an order. Some great ideas here. Life L. Writing Paper and Clairefontaine Triomphe are my “go to” papers for letter writing. I think Diamine inks are great too… There are so many colours to choose from and they’re inexpensive too. Glad you found them useful! Diamine inks are wonderful, but sadly cost a bit more in the US than they do in the UK. Regardless, they’re still pretty widely available at a reasonable price. Happy writing!